Yes, you can keep your goals and your social life! At ITG Diet, our goal is your good health and weight loss success. To help you achieve that success, we've put together a list of healthy entrées to order at some of the most popular restaurants around town. Download a .pdf copy of this convenient restaurant guide to print and take with you here. With fresh, grilled zucchini and roasted squash. Take advantage of their salad bar with lots of fresh vegetables and just make sure you use your own dressing or make with olive oil, lemon, salt and pepper. Sage-roasted chicken, seasonal vegetables (no carrots, no potatoes). Ask for dinner salad, no croutons, no bacon, no cheese. Bring dressing or use olive oil and lemon with salt and pepper. They offer broccolini for another side dish. 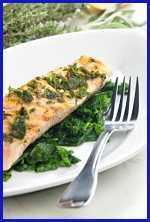 Wild Alaskan salmon served grilled on a bed of fresh spinach. Ask for no potatoes and double spinach (or ask for steamed veggies to replace potatoes no carrots). Arugula, romaine, kale, tomatoes, onions and cucumbers. Half or full portion. Order without dressing and sub squeezed lemon or Walden Farms dressing. Add grilled chicken. Order with broccoli or mixed vegetables. With cucumber, tomato n' onion salad (with lemon, salt and pepper, olive oil) fresh steamed broccoli. Served with choice of side, a mixed green salad, fresh vegetable medley (no carrots), fresh steamed asparagus. Order with plain broccoli, steamed spinach. Mixed greens, grape tomatoes, green beans and red onions. (Order with no linquine crisps and no dressing.) Use Walden Farms or oil & vinegar dressing. Substitute chicken or shrimp for salmon. Order with steamed broccoli and southern green beans. Ask for double portion of steamed broccoli as the side and a house salad, no croutons, no cheese, no bacon, bring dressing or use olive oil and white or apple cider vinegar and salt and pepper. Sliced filet mignon with cipollini onions and wild mushrooms. Ask for salad with field greens, tomatoes and fresh herbs and grilled asparagus with lemon oil. Large shrimp skewered with fresh red bell peppers, red onion, yellow squash and zucchini, char-grilled with steamed broccoli (instead of rice). With fresh steamed broccoli or seasonal mixed vegetables. Ask for plain broccoli or other steamed vegetables. Sides include fresh asparagus and steamed veggies. 100% USDA Choice sirloin with Southwestern spices & drizzled with spicy citrus-chili sauce, topped with grilled avocado slices, garlic roasted tomatoes & chopped cilantro. Served with fresco salad. Ask for no avocado and no sauce, add broccoli or other vegetable. All vegetables of your choice and you can switch off your choice of protein. No black olives, cheese or bacon. All-natural rotisserie chicken is marinated to perfection, but peel the skin off. Sides: Order green beans or fresh steamed vegetables. Below are some quick tips for going out that we hope you find useful. When ordering, always make sure your lean protein is up to 8 ounces (grilled, sauted, not breaded or fried). When ordering a salad, remember to order it without croutons, cheese or bacon. Oil & vinegar are acceptable (not not balsamic or red wine vinegar), but it's best to bring your own healthy dressing. Any entree can be ordered with double veggies instead of potatoes or starchy food. Tell the waiter or waitress not to bring bread to the table.